This entry was posted on Wednesday, November 17th, 2010 at 10:40 am and is filed under Young Americans: 1975. You can follow any responses to this entry through the RSS 2.0 feed. Both comments and pings are currently closed. I think it’s partially because Young Americans was the first Bowie album I heard, but I never thought this cover was as bad as everyone’s made it out to be. Sure, once I discovered “Who Can I Be Now?” and especially “It’s Gonna Be Me,” it rifled me that it was for this those great songs got cut, but even so, it’s not dreck. I must admit, though, that I have a particular (and unpopular) distaste for the original. The lyrics are so cornball it seems to me like they’re begging for a full-on “soul” take. Inflections and wild sweeps, call and response, “no no no no’s” abound, it seems somehow appropriate to me. It’s much like his take on “Fill Your Heart,” (appropriately another big favorite of mine, I guess) Bowie takes the original vibe of the song and does a victory lap around the solar system. Not essential, perhaps, but not unenjoyable. The original “ATU” really’s paled for me over the years too, but I’ve just loathed this track since I was a kid, for whatever reasons: perhaps I should’ve recused myself from writing about it, as I likely can’t judge it properly. I was hoping some defenders (even modest ones) would show up in the comments, so thanks. My finger couldn’t reach the skip button quick enough when I first got the album in 1991. I loathed it. The Beatles version was weirdly a favourite of mine at the time, and the Bowie version just seemed to brutalise the fragility of it. I hated the sobbing vocal on ‘into a paper cup’ in particular. Over the years I’ve stopped reaching for the skip button, and ATU has grown on me. I’m used to it, I suppose. Like Ian, I don’t think it’s essential but I enjoy it while it lasts. Bit like Dr. Pepper. I love Dr. Pepper! Sort of. I mean, it’s fine. Just like ATU, so you’re right. I think it’s funny, though, because I always loathed the lyric of “into a paper cup” anyways. It’s a sophomoric bit of drivel, so why not make it as unintentionally hilarious as possible. Of course, we allll know Bowie didn’t have that in mind when he covered it. You can tell he was proud of covering a Beatles song with a Beatle just by looking at the sleeve. The other songs are credited to “Bowie” or “Bowie/Lennon/Alomar.” “Across The Universe” is labeled as “John Lennon and Paul McCartney.” It’s a bit silly, really. But hey, I can’t say I wouldn’t do the same. Have you all heard that story (I don’t know if it’s true) of when Bowie was hanging out with Paul McCartney and wouldn’t stop playing Young Americans? He kept putting the record on again and again until Paul (I think) said “Maybe let’s listen to something else?” Tears ensued. Drugs, yo. Gotta eat more than green peppers and milk to be normal, y’know? I think he could have done a great Happiness is a Warm Gun. It always seemed odd to me that he sang ‘Nothing’s gonna change my world’ so passionately, when he was very much into changing his world. Unless! it was because he was feeling disconnected so liked the reassurance of the statement. Always hoped that a David Bowie recipe book would appear called Cocaine, Milk and Green Peppers: Cooking with David Bowie. But sadly, it never did. That Lennon/McCartney story is true, I believe. I think it was on the third (!) play of Young Americans that Macca snapped, in his very polite way. but having watched it still don’t see where the dis/snub is? As covers go, it’s not too bad because it does something different to the original, pretty much an essential attribute for cover versions. But this is always the track I skip when listening to the album (and I like the original Beatles version even less). If anything, it’s a testament to the effects cocaine has on a musician’s arrogance (“Nothing (apart from me) is gonna change my world!“) and sense of objectivity. YA’s original track list/omissions being further evidence. Woah. I never hated this Bowie’s cover & I still don’t hate it. I actually REALLY like it. And I am a huge fan of the Beatles, listened to them long before I’d even heard of Bowie… I think I like Bowie’s version better than the original but my favourite version of this song would probably be Rufus Wainwright’s. Have you found it, yet? I love Bowie’s version. Everyone i know loves it also. The Beatles version while i do like it is more of a Lullaby in my opinion. I guess it might be the same as the folks that like Nirvana’s version of The Man who sold the world. i Hate that version. I would have preferred it if he had put It’s gonna be me in its place but it is fine if a little sycophantic. My favourite version is by Fiona Apple. ‘Excruciatingly bad’ just about sums it up for me. Terrible, car crash stuff. I just got used with it. The first seconds used to gave me inst. cringe. Now, I kinda like it…. Maybe a case of Stockholm Syndrome. Bowie’s take on ATU is polarizing, yes, but it’s nowhere near as bad as the “God Only Knows” atrocity 10 years later; I personally admire it for his vocal performance–there were some amazingly strong sounds coming out of that 90 pound cocaine addict. I agree with you, God Only Knows is awful. Across The Universe is so weird it’s good. And his vocals are amazing. I was never a fan of the original but the cover is worse by a fair bit. There’s something about the timing of the ATU lyric not scanning / being off beat with the music that really bothers my ears. 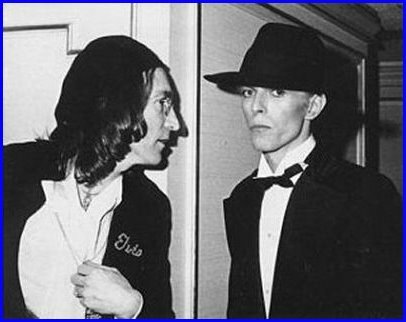 Anyway, my main question from the article is that Bowie first met Lennon in 1974. Reading up on Watch That Man recently, was it not often though that “A lemon in a bag played the Tiger Rag” was Lennon? Can’t have been if they didn’t meet until ’74. I find it strange how bad many seem to perceive Bowie’s cover to be. It was the first version of the song I heard and I really still like it, it’s different to the original version and when I hear the Lennon version I really feel like I’m missing the part where the vocal is almost shouted like Bowie does towards the end. Different intepretation, I don’t think it is neccesarily bad. Bowie’s is like breaking through a wall. Lennon’s is like gliding over the wall.